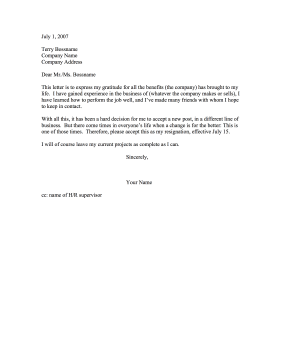 Speaking very positively about the experience and opportunities, this resignation letter is for employees who want to express gratitude. This letter is to express my gratitude for all the benefits (the company) has brought to my life. I have gained experience in the business of (whatever the company makes or sells), I have learned how to perform the job well, and I've made many friends with whom I hope to keep in contact. With all this, it has been a hard decision for me to accept a new post, in a different line of business. But there come times in everyone's life when a change is for the better: This is one of those times. Therefore, please accept this as my resignation, effective July 15. I will of course leave my current projects as complete as I can.